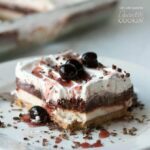 Red Velvet Lasagna Dessert: 4 delicious, velvety layers! 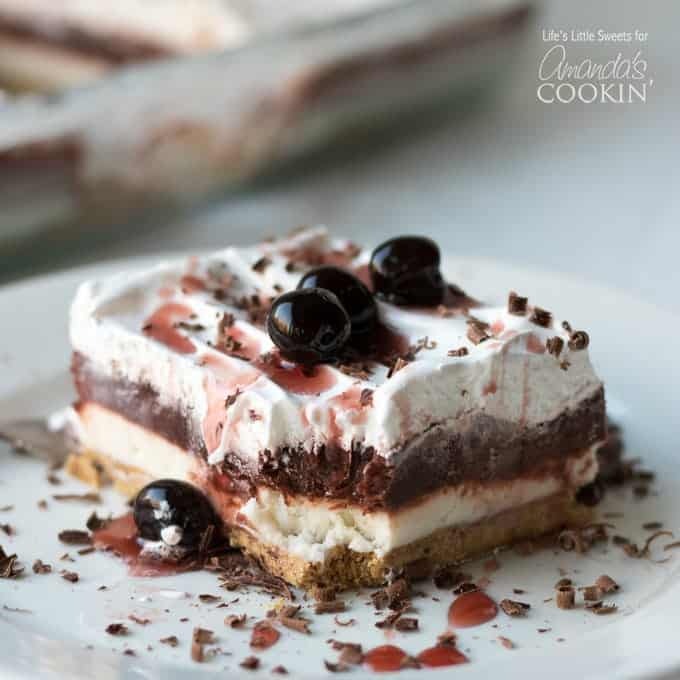 This Red Velvet Lasagna is a layered, no-bake dessert recipe with a crunchy graham cracker crust, cream cheese layer, red chocolate pudding layer and topped with Cool Whip, chocolate shavings, and cherry syrup. 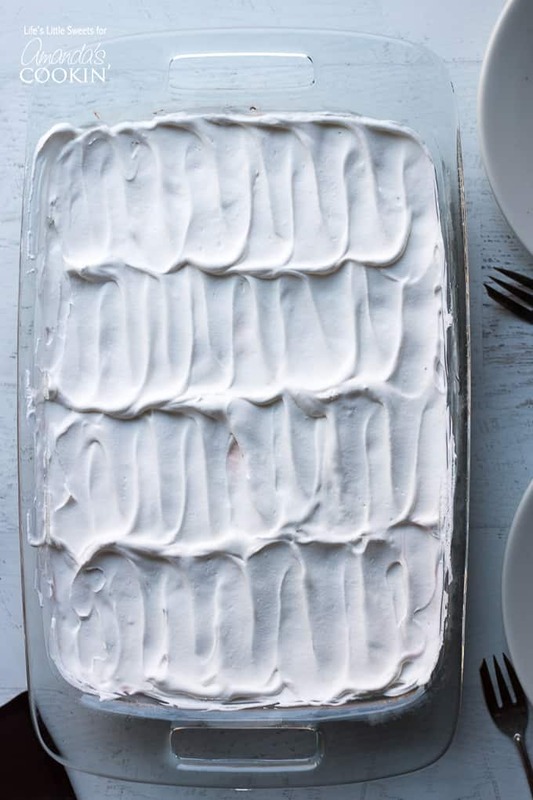 This one-pan dessert has 4 delicious, velvety layers and uses a 9 x 13-inch pan, making the perfect dessert to bring to a gathering or potluck. We love lasagna desserts and that’s obvious based off of all the ones we have! I’ve listed a ton of them at the end of this post, but Chocolate Lasagna is probably my all-time favorite. 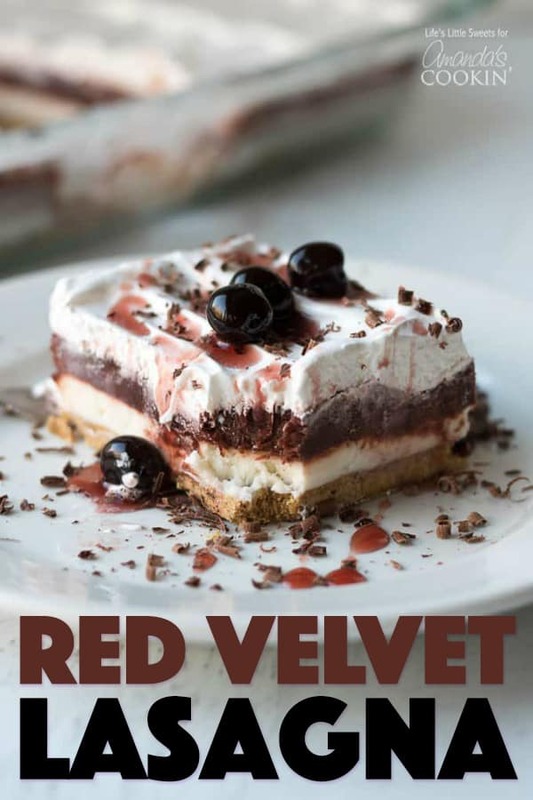 Red Velvet Lasagna has all the makings of a traditional lasagna/lush dessert with a “romantic” twist: red velvet. Looking forward towards Valentine’s Day, I came up with this Red Velvet Lasagna to be the perfect “something red” for the holiday. Honestly, I think anything red velvet-themed is appropriate to be served at any time of the year – just sayin’. Who else thinks of Valentine’s Day months ahead? I’m a romantic at heart and if I had to choose a favorite holiday, V-day – as I like to call it – would be it because it’s all about love. I highly suggest using an offset spatula for spreading the cream cheese, pudding and Cool Whip layers. This enables you to get nice, even layers. To get super defined slices, I recommend freezing the dessert for 6 hours or overnight to get it solidly frozen. Doing this makes it easier to handle since it is a pudding dessert. Once you take it out of the freezer, it defrosts pretty quickly within a half hour. I think it tastes best when cold/chilled versus room temperature. 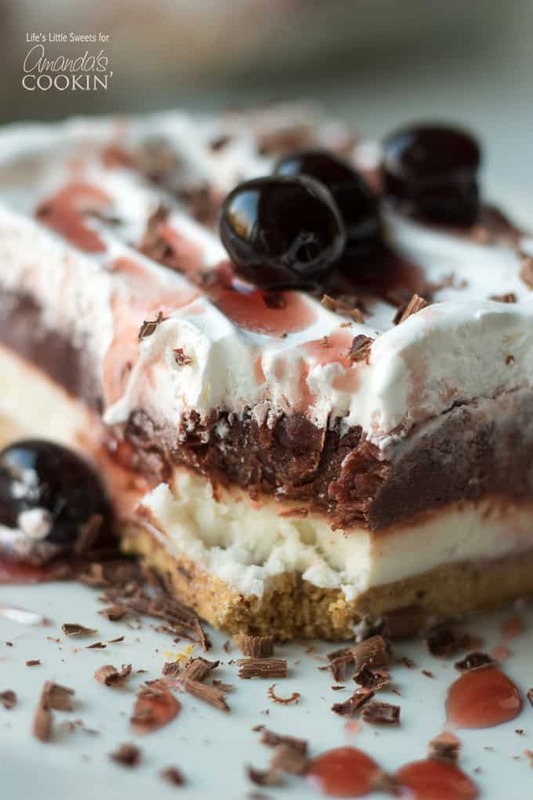 If you will be topping this layered dessert with shaved or curled chocolate, you can use a vegetable peeler to get little chocolate curls or a box grater to get shaved chocolate. It goes really well with the chocolate pudding and really dresses up the dessert for serving. You can also get creative by selecting some festive sprinkles to sprinkle on top, depending on the holiday or occasion that you are having this dessert. 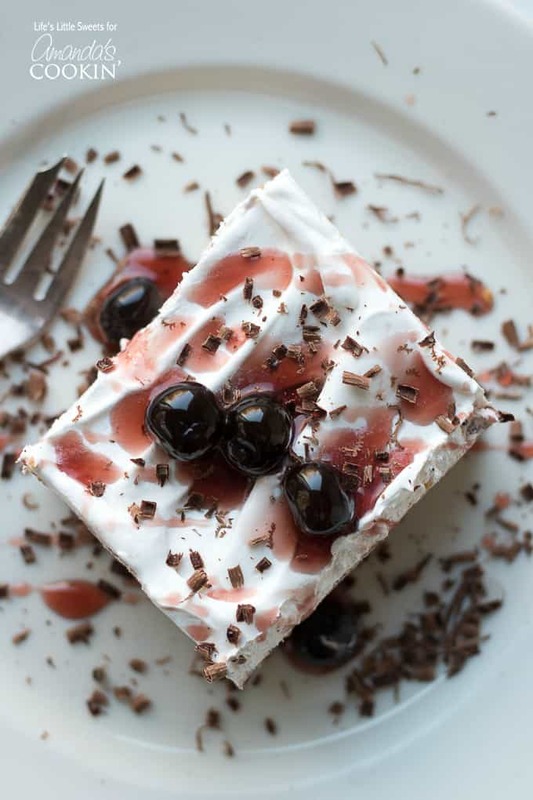 For serving, you can use cherries in syrup like wild dark cherries (shown in the photos) but you can also use strawberry/raspberry syrup to drizzle if you prefer. I know you will love this Red Velvet Lasagna! 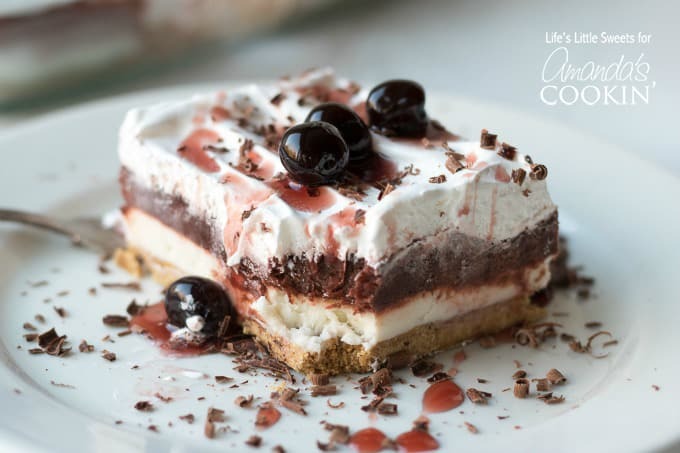 Don’t forget to check out more lasagna and lush dessert favorites below! 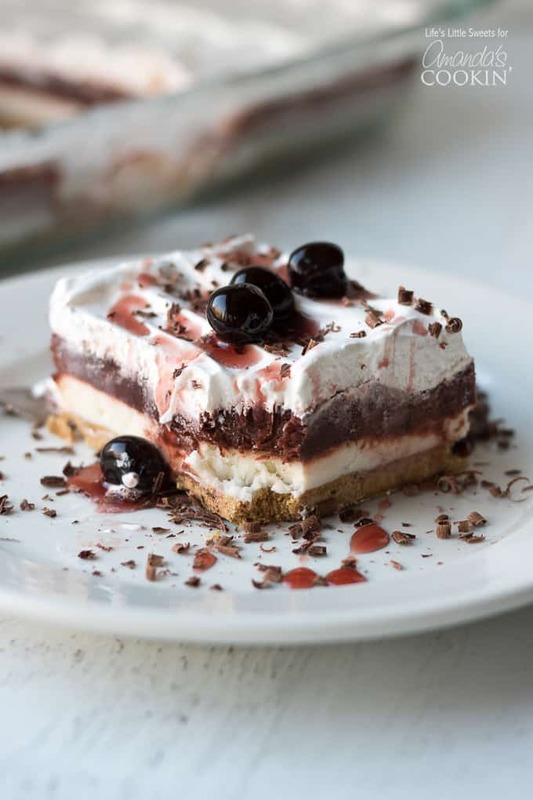 This Red Velvet Lasagna is a layered, no-bake dessert recipe with a crunchy graham cracker crust, cream cheese layer, red chocolate pudding layer and topped with Cool Whip, chocolate shavings and cherry syrup. Using a hand held electric mixer, combine cream cheese, 1 cup sugar, 1-2 tablespoons apple cider vinegar or fresh squeezed lemon juice. Mixture should be even and smooth. Spread evenly on top of the graham cracker crust. In a large mixing bowl, whisk the milk and instant chocolate pudding mix until set. Add the red food coloring until desired color is reached. It may take 4-5 minutes to thicken. Spread evenly on top of the cream cheese mixture. Using an offset spatula, spread thawed whipped topping on top of the pudding layer. Sprinkle with shaved or curled dark chocolate. For serving drizzle with a red cherry (or other fruit) sauce. Optionally, you can freeze the Red Velvet Lasagna overnight for more defined slices (as shown in the photos). Do not freeze if you substitute homemade whipped cream because it might not hold up like frozen whipped topping like Cool Whip. I suggest using an offset spatula for spreading the layers and make sure it’s clean before starting a new layer. After refrigerating, for serving to show more defined layers, you can just take a butter knife and “wipe” along the sides and the layers will show nicely. You can freeze the Red Velvet Lasagna overnight (at least 6 hours) to get more defined slices. Make sure you use a sharp knife to cut down into the bottom crust first before removing with the spatula. It will defrost fairly quickly depending on the room temperature. This post was originally published on this blog on Jan 1, 2018. YUM! It looks so good and so easy to make!